Background and objectives Increased bone resorption, low bone formation, and abnormal mineralization have been described in stone formers with idiopathic hypercalciuria. It has been previously shown that the receptor activator of NF-κB ligand mediates bone resorption in idiopathic hypercalciuria (IH). The present study aimed to determine the expression of fibroblast growth factor 23 (FGF-23), vitamin D receptor (VDR), and sclerostin in bone tissue from IH stone formers. Design, setting, participants, & measurements Immunohistochemical analysis was performed in undecalcified bone samples previously obtained for histomorphometry from 30 transiliac bone biopsies of idiopathic hypercalciuria stone-forming patients between 1992 and 2002 and 33 healthy individuals (controls). Serum parameters were obtained from their medical records. Results Histomorphometry disclosed 21 IH patients with high and 9 IH patients with normal bone resorption. Importantly, eroded surfaces (ES/BS) from IH patients but not controls were significantly correlated with VDR immunostaining in osteoblasts (r=0.51; P=0.004), sclerostin immunostaining in osteocytes (r=0.41; P=0.02), and serum 1,25-dihydroxyvitamin D (r=0.55; P<0.01). Of note, both VDR and sclerostin immunostaining were significantly correlated with serum 1,25-dihydroxyvitamin D in IH patients (r=0.52; P=0.01 and r=0.53; P=0.02, respectively), although VDR and sclerostin expression did not differ between IH and controls. IH patients with high bone resorption exhibited a significantly stronger sclerostin immunostaining than IH patients with normal bone resorption. FGF-23 expression in osteocytes from IH patients did not differ from controls and was not correlated with any histomorphometric parameter. Conclusions These findings suggest the contribution of VDR and sclerostin, as well as 1,25-dihydroxyvitamin D, to increase bone resorption in idiopathic hypercalciuria but do not implicate FGF-23 in the bone alterations seen in these patients. Idiopathic hypercalciuria (IH) represents a generalized dysregulation of calcium homeostasis, which includes increased gut calcium absorption, decreased renal calcium reabsorption, and a tendency to lose calcium from the bone (1,2). Abnormal bone remodeling among hypercalciuric stone formers has been disclosed by histomorphometry and characterized as increased bone resorption, low bone formation, and a mineralization defect as previously shown by our group (3–6) and others (7,8). In a previous study, we found that the receptor activator of NF-κB ligand (RANKL) mediated bone resorption in IH patients (6). Fibroblast growth factor 23 (FGF-23) is produced in bone and acts on kidney as a systemic phosphaturic factor. Although increased serum levels of FGF-23 were found in hypophosphatemic nephrolithiasis patients (9), FGF-23 overexpression in cultured calvarias may suppress bone formation and matrix mineralization irrespective of the phosphate homeostasis (10). Serum 1,25-dihydroxyvitamin D [1,25(OH)2D3] levels in IH patients are either normal or high (11–14), and vitamin D receptor (VDR) polymorphism has been associated with hypercalciuria (15). In hypercalciuric patients, VDR concentration was normal in fibroblasts (13) but 2-fold higher in PBMCs (14), despite normal serum 1,25(OH)2D3, suggesting an altered tissue vitamin D response. Genetic hypercalciuric stone-forming (GHS) rats exhibit increased VDR coupled with normal levels of 1,25(OH)2D3, resulting in increased functional VDR–1,25(OH)2D3 complexes (16). Finally, increased bone resorption has been observed after calcitriol exposure in GHS cultured calvarias (17). Another important regulator of bone metabolism produced in osteocytes is sclerostin (Scl), which is codified by the SOST gene and functions as a negative regulator of bone mass and osteoblast differentiation (18,19), but it also promotes osteoclast formation and activity (19). In the present study, we aimed to evaluate bone expression of FGF-23, VDR, and Scl in IH stone formers and examine their relationship with bone remodeling alterations. In this retrospective study, undecalcified bone fragments obtained from transiliac bone biopsies of 30 Caucasian stone-forming IH patients with normal renal function (previously performed from 1992 to 2002) were included. Only those patients with evidence of uni- or bilateral radio-opaque stones consistent with calcium composition were selected. Exclusion criteria for bone biopsy were hyperparathyroidism, renal tubular acidosis, sarcoidosis, diabetes mellitus, and use of corticosteroids, bisphosphonates, citrate, or diuretics. IH was defined by normocalcemia and 24-hour urinary calcium>250 mg/d (for women) and 300 mg/d (for men) or >4 mg/kg per day in two nonconsecutive samples under unrestricted diet. Histomorphometric parameters, serum levels of calcium, phosphate, creatinine, 1,25(OH)2D3, and intact parathyroid hormone (PTH), obtained near the date of the bone biopsy were retrieved from their medical records; 1,25(OH)2D3 had been determined by radioimmunoassay (Diasorin; Stillwater, MN/Nichols Institute Diagnostics, CA) and PTH by different immunoradiometric assays according to the availability of methods between 1992 and 2002 (3–5). The Ethical Committees of both institutions approved this study, and all patients signed written consent by the time that the biopsies were performed. Histomorphometric parameters had been obtained by transiliac bone biopsies as previously described (20). The control group for static parameters encompassed 33 healthy individuals (18 men and 15 women; 25 Caucasian and 8 non-Caucasian; 32.9±5.4 years) selected from our bone histomorphometry database (20) consisting of bone biopsies obtained immediately after early death from victims of gunshot or knife wounds, trauma, or traffic accidents who were not known to have any disease or be users of anticonvulsant drugs, corticosteroids, or any medication that interfered with bone metabolism based on their medical records. Dynamic parameters were compared with the controls from the work by Melsen and Mosekilde (21), which were obtained from 41 volunteers with similar age: 12 men (mean age=32 years) and 29 women (mean age=29 years). Immunostaining for FGF-23, VDR, and Scl was performed in IH patients and controls according to a technique previously described (22). The primary antibodies used were monoclonal anti-human FGF-23 (provided by Susan C. Schiavi, Genzyme, Framingham, MA), rat monoclonal anti-human VDR (ABR-Affinity BioReagents, Inc. Golden, CO), and human monoclonal antibody anti-Scl (R&D Systems, Minneapolis, MN). Counting was performed on 30 microscopic fields at a magnification of ×200 for each bone sample. The area of immunopositivity was determined by the number of positive points in the tissue compared with the total number of points. Normality of distribution was assessed by the Kolmogorov–Smirnov test. Accordingly, data are expressed as mean±SD or median (25th, 75th percentiles). Differences between groups were analyzed using Mann–Whitney or unpaired t tests depending on the distribution of variables. Correlations between immunohistochemistry and biochemical or histomorphometric parameters were assessed by Pearson or Spearman correlation testing as appropriate, and confidence intervals are presented. The level of significance was set up as P<0.05. Prism software version 4.0 (GraphPad Software Inc., San Diego, CA) was used for statistical analyses. IH patients with calcium stones (18 men and 12 premenopausal women; 36.3±9.3 years) presented mean urinary calcium of 340.8±70.6 mg/24 h, eGFR of 81.1±12.2 ml/min per 1.73 m2, and serum creatinine, calcium, and phosphorus of 0.92±0.12, 9.6±0.5, and 3.2±0.5 mg/dl, respectively. Two patients were hypophosphatemic, and two patients presented 1,25(OH)2D3 values slightly above normal ranges. All had serum PTH within normal limits: median values for intact PTH were 33.5 (21.5, 49.5) and 20.3 (12.5, 37.5) pg/ml and median values for 1,25(OH)2D3 were 40.7±17.1 and 50.1±16.1 pg/ml according to the method used. As shown in Table 1, IH patients presented significantly lower mean bone volume (BV/TV) and trabecular number (Tb.N) and significantly higher trabecular separation (Tb.Sp). Mineralization lag time (MLT) was significantly higher, and mineralizing surface (MS/BS) was significantly lower. Both eroded surfaces (ES/BS) and osteoclast surfaces (Oc.S/BS) were significantly higher. ES/BS from IH patients did significantly correlate with serum 1,25(OH)2D3 (r=0.55; P<0.01). Compared with controls, IH patients did not present statistical differences for bone immunostaining of FGF-23 in osteocytes (6.8±5.9% versus 6.0±5.0%; P=0.49), VDR immunostaining in osteoblasts (21.4±17.8% versus 28.7±20.1%; P=0.14), VDR in osteocytes (13.8±9.6% versus 12.0±8.5%; P=0.52), VDR in the total of both cells (16.4±11.5% versus 18.9±11.1%; P=0.35); VDR immunostaining in osteoclasts was negligible, and Scl bone immunostaining in osteocytes (9.1±11.1% versus 6.1±5.5%; P=0.22; data not shown in tables). As seen in Figure 1, mean bone FGF-23 immunostaining in IH patients classified as having high bone resorption (ES/BS=1 SD above mean, n=21) did not differ from normal bone resorption (ES/BS<1 SD, n=9). Mean VDR bone immunostaining in the sum of all stained cells was numerically but not statistically higher in patients with high versus normal ES/BS. Mean Scl immunostaining in osteocytes was significantly stronger in high versus normal bone resorption IH patients. The median (25th, 75th percentiles) estimated duration of disease for patients with high versus normal ES/BS (7.0 [5, 17] versus 2.0 [1.5, 10] years) presented a marginal trend to significance (P=0.05; data not shown). Bone immunostaining quantification (%) of fibroblast growth factor 23 (FGF-23), vitamin D receptor (VDR), and sclerostin (Scl). Idiopathic hypercalciuria patients with high (black bars; n=21) or normal (white bars; n=9) bone resorption defined by eroded surface (*P=0.03 versus white bars). The quantification of immunostaining was determined by the ratio of positive to total number of stained cells in bone tissue. Figure 2 illustrates immunoreactivity localization of FGF-23 in osteocytes, VDR in osteoblasts, and Scl in osteocytes in bone tissue. Immunohistochemistry for FGF-23, VDR, and Scl in bone tissue (positive immunostaining is shown in red). 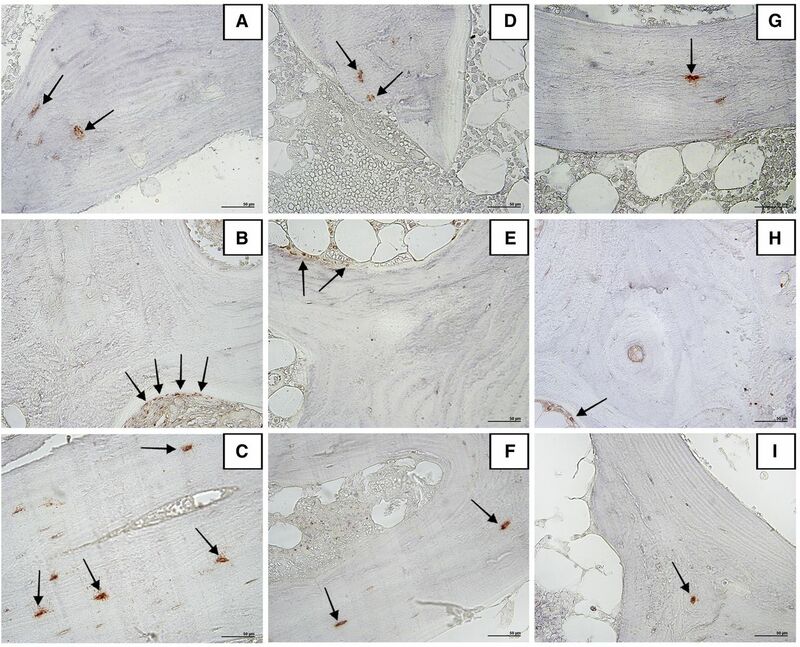 No differences between the patterns of FGF-23 immunostaining in osteocytes (arrows) in (A) a patient with high bone resorption, (D) a patient with normal bone resorption, and (G) a control patient are observed. Examples of higher expression of VDR in osteoblasts (arrows) and Scl immunostaining in osteocytes (arrows) from an idiopathic hypercalciuria patient with high bone resorption are given in B and C, respectively, contrasting with the fewer stained cells in an idiopathic hypercalciuria patient with normal bone resorption (E and F for VDR and Scl, respectively) and a control individual (H and I, respectively). Original magnification, ×200. Table 2 shows significant correlations between serum 1,25(OH)2D3 and bone expression of VDR in osteoblasts and Scl in osteocytes. FGF-23 immunostaining did not correlate with any histomorphometric parameter, which is seen in Table 3, nor in the control group (data not shown). ES/BS significantly correlated with VDR bone immunostaining in osteoblasts and the sum of all stained cells from IH but not in the controls (data not shown). Tb.N was positively correlated with VDR bone immunostaining in osteoblasts from IH patients but negatively correlated with VDR in osteoblasts and the sum of all cells from controls (r=−0.46; P=0.008 and r=−0.49; P=0.004, respectively; data not shown). Scl immunostaining in osteocytes was significantly correlated with ES/BS in IH patients but not the control group. In the control group, Scl immunostaining correlated with BV/TV (r=0.47; P<0.01), Tb.N (r=0.48; P<0.01), and Tb.Sp (r=−0.56; P<0.001; data not shown). Decreased bone mineral density (BMD) is commonly encountered in IH patients (23), and an increased prevalence of bone fractures has been reported for nephrolithiasis patients (24,25). GHS rats also exhibited reduced BMD and more brittle and fracture-prone bones (26) because of lower trabecular volume and mineralized volume and thickness. Human histomorphometric studies have shown either normal or low bone formation but a unanimous bone mineralization defect (3,5,7,8,27,28). The exact pathophysiological underlying mechanisms for altered bone remodeling in stone formers remain unknown, but increased production of cytokines by peripheral monocytes of hypercalciuric patients has been reported (29,30). At a bone level, we have previously shown a lower expression of TGF-β in bone immunostains from hypercalciuric stone formers (6), which might have contributed to the lower bone formation and delayed bone mineralization (31). To address if a putative excess of FGF-23 could negatively regulate bone mineralization (10), the first purpose of the present study was to evaluate its bone expression. Bone FGF-23 from IH patients was not different from controls and did not correlate with histomorphometric parameters (nor in the control group). These findings differ from the findings of Pereira et al. (32), who observed bone FGF-23 expression to be inversely correlated with skeletal mineralization in CKD patients. However, given that renal function was not compromised in the present series, the comparison may be not suitable. Although a significant inverse association between serum phosphate and FGF-23 was reported in recurrent stone formers (9), the sample was not exclusively composed of hypercalciuric individuals. In our study, there were no significant correlations between FGF-23 bone immunostaining and serum phosphate or between PTH and vitamin D. The small number of hypophosphatemic patients in the current series might have accounted for the lack of such correlation. Among the presumed mechanisms responsible for impaired bone formation in IH patients, elevated serum 1,25(OH)2D3 levels may play a role (11–14,33,34) through decreasing bone collagen synthesis (31) or increasing bone resorption (35). A greater increase in urinary calcium with 1,25D in GHS rats fed a low calcium diet has suggested that the additional urinary calcium must result from increased bone resorption because of the increased number of VDR in their bone cells (35). With a few exceptions (27,28), most of the previous histomorphometric studies have shown increased bone resorption among hypercalciuric patients (3,5,7,8). Vitamin D-induced osteoclastogenesis seems to be accomplished through a VDR-mediated increase in RANKL expression in osteoblasts (36). In the present study, we did not observe an increase in bone expression of VDR in the total of stained bone cells from IH patients compared with controls. However, when we compared the patients who exhibited high versus normal bone resorption, VDR immunostaining was numerically higher but not significantly different in the former group (Figure 1). Moreover, a strong and significant correlation between bone expression of VDR and ES/BS was disclosed in the IH group as a whole, which was attributed to the marked VDR staining in osteoblasts, that was not evidenced in control group. Although we recognize that osteoclasts also express VDR (37), the reasons why we did not observe substantial VDR immunostaining in these cells remain unclear. When we tried to integrate present VDR bone expression with that of RANKL, osteoprotegerin, and TGF-β evidenced in our previous study (6), we found no correlation. However, it is noteworthy that, in the current sample, we could not retrieve sufficient amounts of tissue from six bone specimens derived from the material in the work by Gomes et al. (6), probably because of multiple cuts on the microtome and exposure to chemical reagents in prior immunohistochemical analysis. Unfortunately, all these specimens had originated from patients with high ES/BS, and therefore, it might have compromised the disclosure of a possible correlation between these parameters. In the present series, serum 1,25(OH)2D3 correlated with VDR immunostaining in osteoblasts from IH patients. These findings agree well with experimental data showing a 4-fold increase in the level of VDR in GHS calvarias versus controls and a greater sensitivity to 1,25(OH)2D3 compared with bone from control rats (17,35). The direct correlation that we have found between VDR and Tb.N in osteoblasts in IH further reinforces the contribution of VDR to increase bone resorption. Conversely, Tb.N was negatively correlated with VDR expression in controls. It has already been speculated that even small elevations of serum 1,25(OH)2D3 seem to be sufficient to increase bone resorption when dietary calcium intake is low, indicating that 1,25(OH)2D3 may upregulate its own receptor (14,38). A previous evaluation of stone-forming patients in our laboratory (39) revealed a very low mean calcium intake (around 500 mg/d), and most of the bone tissue samples presently analyzed had been retrieved from patients with up to 60% exhibiting low calcium intake (3,5). In the present study, we observed a trend for a direct association between VDR bone expression and mineralization lag time (r=0.36; P=0.06). Therefore, the increase in bone expression of VDR might have helped to further compromise bone mineralization in our IH patients, because the low calcium intake probably contributed to a negative calcium balance. Indeed, an experimental study by Lieben et al. (40) has shown that, when intestinal calcium absorption decreases, calcium mobilization from bone is elicited and bone matrix mineralization is suppressed because of decreased calcium incorporation in bone by osteoblastic VDR signaling that stimulates mineralization inhibitors. The signaling pathways through which Scl exerts its effects on bone metabolism are still incompletely understood. Although Scl has emerged as a stimulator of osteoblasts apoptosis (18) and a potent inhibitor of Wnt–β-catenin signaling (hence, decreasing bone formation) (41), an experimental model in which the Wnt pathway was specifically inhibited in osteocytes has shown normal bone formation but a significant increase in osteoclastic bone resorption instead (42). The reduction of the antiosteoclastogenic factor osteoprotegerin (OPG) and the concomitant increase in the osteocytic RANKL/OPG ratio might have contributed to the increased number of osteoclasts and resorption in this model. Additional studies showing a severe osteopetrotic phenotype in mice lacking RANKL specifically in osteocytes (43) reinforced that osteocytes are the major source of RANKL in bone remodeling in vivo. The mechanism whereby Scl controls osteoclast formation and activity seems to occur through a direct increase in mRNA expression of RANKL in osteocytes to a greater extent than the decrease in OPG (19). It has been hypothesized that, in response to catabolic stimulus, Scl expressed by mature mineral embedded, or even apoptosing osteocytes, may act in an autocrine manner, increasing local expression of RANKL relative to OPG, as well as a paracrine manner, inducing such expression in immature osteocytes immediately below the osteoblastic lining cells (44). In the current study, mean Scl bone immunostaining in the IH group did not differ from control but was significantly higher in patients with high versus normal bone resorption. Moreover, there has been a significantly positive correlation of Scl bone expression with ES/BS in the entire IH group, which was not observed in the controls. Interestingly, a significant negative correlation of Scl immunostaining with the mineralization surface was evidenced in the subgroup with high bone resorption (r=−0.63; P=0.02) but not in the group with normal bone resorption (r=0.50; P=0.18; data not shown), further suggesting that, within the IH group, the higher bone resorption and compromised mineralization exhibited by most of the patients are associated with bone expression of Scl. These findings agree well with a report about a more significant rise in bone resorption (CrossLaps) than formation (b-AP) in patients with immobilization-induced bone loss (45). Additionally, in a very recent randomized, placebo-controlled trial using a neutralizing antibody to Scl (Romosozumab) in postmenopausal women, the levels of serum β-isomer of the C-terminal telopeptide of collagen, a bone resorption marker, presented a significant and sustained reduction after 12 months, whereas the increase in procollagen N-terminal propeptide, a bone formation marker, was only transitory (46). We did not find an association between bone expression of Scl and RANKL from our previous study (6), but of note, the immunostaining had not been performed in osteocytes (6). At present, we did detect a significant positive correlation between Scl immunostaining and serum 1,25(OH)2D3 in IH patients, which is in accordance with literature data showing that 1,25(OH)2D3 may increase Scl expression in human osteoblastic cells (47). These findings led us to hypothesize that the increased bone resorption seen in some IH patients could be mediated by an increase in vitamin D signaling, stimulating Scl synthesis and leading to an imbalance in the OPG/RANKL ratio. In the control group, Scl immunostaining correlated positively with BV/TV and Tb.N and negatively with Tb.Sp. Once again, given that Scl inhibits osteoblastic activity, a negative correlation would be expected. However, some studies have also found direct correlations between serum Scl and BMD (48,49) or BV/TV in healthy populations (50). A limitation of the present study is that, given its retrospective design and the lack of available blood samples, serum levels of Scl (and FGF-23) could not be determined. Nevertheless, Durosier et al. (50) have shown that Scl levels are markedly different according to the immunoassay used, jeopardizing its interpretation. Although the current number of patients is relatively low, this study comprises one of the largest and substantial series in the literature for a bone biopsy study. In summary, although other investigators had found increased VDR in monocytes (14), no other study in humans has hitherto evaluated VDR expression in bone tissue from IH patients and its relation with bone resorption. It is possible that a longer duration of disease might have contributed to increase bone resorption and influenced the immunohistochemical pattern presently disclosed. In conclusion, present findings suggest the contribution of VDR and Scl to increase bone resorption in IH but do not implicate FGF-23 in the bone alterations seen in these patients. Additional studies are warranted to determine whether antiresorptive therapy will correct these bone abnormalities. Targeting VDR and Scl may be a new therapeutic approach to prevent bone loss in IH. We thank Susan Schiavi for providing fibroblast growth factor 23–antibody; Rosimeire A.B. Costa, Rita Martin, Luciene M. dos Reis, Fabiana G. Graciolli, and Wagner V. Dominguez for technical assistance; Maria Aparecida da Glória and Maria Teresa de Seixas Alves for invaluable suggestions on immunohistochemistry; and Ana M. Misael and Fellype C. Barreto for histomorphometric data. This study was supported by Fundação de Amparo à Pesquisa do Estado de São Paulo (FAPESP) Grant 08/10515-0. Portions of this study were presented at the 50th European Dialysis and Transplant Association Meeting, May 18–21, 2013, in Istanbul, Turkey.